Showing you the placement of a little vine and my new variegated yucca reveals a small area of the garden I've sort of been avoiding photographing since it has an ugly tree stump and leads to the story of the tree's demise in the fall of 2005. I disliked it so much that I couldn't find a photo to show you how it looked before. I kept just wishing it would disappear if I ignored it. 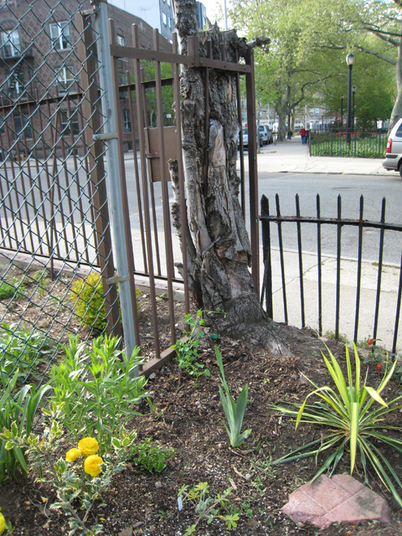 The multi-trunked, self-sown elm of some sort was growing out of scale in between my garden and my next-door neighbors', engulfing the iron fence. Every year it got some sort of icky fungus or maybe galls (?) that formed disgusting sticky yellow balloons all over the leaves. It was beginning to shade out our gardens and I hit it's roots every time I dug. 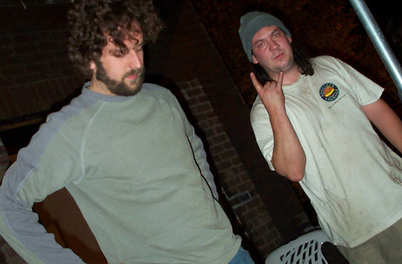 One evening my neighbors (who thankfully shared my repugnance) and I discussed it's future, a conversation which moved quickly from joking about taking it down ourselves to breaking out the Saws-All. 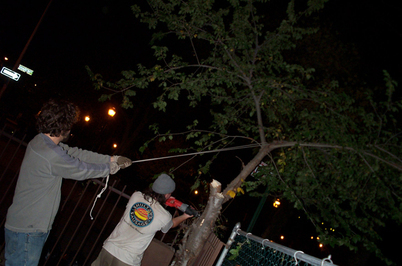 In short order, Douglas had purchased some liquid courage and started sawing away the top branches in the gleam of the streetlamp with help from Brandon. His ill-advised technique was swift and effective and soon we were left with a large pile of branches and the stump. No more shade. The roots were another story and we had to resort to using a chemical to eliminate the suckers that immediately sprouted from the trunk. I suppose I still feel a little guilty killing something for the purpose of beautifying my yard, but gardening forces you to make those choices sometimes. As you note, it was self-sown, in the wrong place. It was sickly, maybe because it had a fence inside it. Think of it as tree euthanasia, if that helps! When we bought our house, we had to take down five trees on our property. Only one of them had been deliberately planted, originally as a foundation shrub who knows how many decades ago. It was taller than the house and destroying the porch, so it had to go. The others were all weed maples which had seeded themselves along the fences and next to the garage. Each was causing problems, or would be soon. Wrong plant, wrong place. Hi, Carolyn. You gotta do what you gotta do. Putting that tree out of its misery (and yours) sounded like the right thing to do. Enjoy your new, sunny garden. Murder! Action! Liquid courage! Now this is why I read garden blogs. That tree obviously had it coming, Care. Don't spend another moment on guilt.